One important aspect of keeping tropical fish is aquarium lighting. This is an often overlooked area that can sometimes be confusing for a beginner to aquariums. The confusion may come from the many available types of fish tank lighting that you can use to light your tank. The type of light you need for your tank really depends on what you plan on keeping in your tank. This article is a very general introduction into aquarium lighting and below we discuss the various types of lighting needs based on aquarium type. These are general recommendations and we encourage you to research your livestock s lighting requirements for best results. These are the type of lights that come with most starter tanks and are very affordable. They typically range from 15 to 40 watts and have Kelvin ratings from 3,000 to 10,000. Kelvin is the scale used to measure the color temperature. They are very cheap to run and replace. These are a step up from the regular flourescent lights. They typically range from 10 to 100 watts and have Kelvin ratings from 5,000 to 10,000. They offer really bright and intense light but they do put off some heat that may raise the tank water temperature. Running power compact lights will require special hoods and because of the heat produced, they often come with installed fans in the hood. HO flourescent lights typically range from 20-60 watts and have Kelvin ratings from 6,000 to 11,000 They are more expensive than regular flourescents and usually last longer. These lights require a T5 light fixture. VHO flourescent lights typically range from 75-60 watts and have Kelvin ratings from 10,000 to 20,000. These lights are very expensive and produce a lot of heat. They require a ballast and/or special fixture especially for VHO lights. They have fans incorporated into the lighting unit to help keep the lights and aquarium cool. Even though they come with fans you may need to equip your tank with an aquarium chiller to prevent your tank water from overheating. Metal Halide lamps typically range from 175-1000 watts and have Kelvin ratings from 5,000 to 20,000. This type of light is closest to the sun in terms of luminousity but they are very expensive to buy, operate and replace. They produce a lot of heat and usually must be fan cooled. Ballasts with fan units included are widely available. This is often the preferred method of lighting a reef tank setup with anemones and corals that need higher intensity lighting. They can be configured in many ways due to their small size. Many of the light fixtures being sold now include moon lights which are LEDs. So we re starting to see them more often, but even though these LED s are very promising we are probably still a few years away from using them as the primary light source on most home aquariums. For a freshwater tank with no live plants you can get by with the low watt flourescent lights. These lights are typically between 18 and 40 watts and should last for a year or longer before they burn out. Growth rate desired Typically, plant keepers try to provide anywhere from 2-5 watts per aquarium gallon. Research the plants you want to keep beforehand to determine if you can provide the light needed. Fish only saltwater tanks will work fine with regular flourescent bulbs. Try to get a "full spectrum" light for your tank. While tanks with live rock can get by with regular flourescent full spectrum lights they will do better with flourescents and actinic lights (blue light). It really depends on how well you want the coralline algae to grow. Certain types of coralline algae seems to grow better with higher amounts of actinic lighting. Saltwater reef tanks with corals, clams and other light needing organisms will need the high output, very high output flourescent or metal halide lamps. Certain corals, anemones and clams require very intense lighting levels that can only be provided with VHO and metal halide light sources. A general rule of thumb for reef tanks is between 4 and 10 watts per aquarium gallon. Many reefers have lighting systems incorporating metal halides and VHO flourescent tubes. Research the species you want to keep because light requirements can vary. Because of the amount of heat these light units can produce, you may need to get an aquarium chiller to keep your tank water temperature in an acceptable range. The expense of lighting a reef tank may be just as high or higher than the cost of the live rock. Photo Period - How long do you leave the lights on? How long should the fish tank lights stay on for? We get this question frequently. A good range to aim for would be anywhere from 6 to 12 hours. Remember that fish like and need to rest just like other animals. Fish only setups could range from 6 to 12 hours, reef tank setups and freshwater planted aquariums could range from 10 to 12 hour photo periods. Leaving the lights on for longer time periods could contribute to nuisance algae growth (just one of the factors with algae growth), higher tank temperatures and quicker tank water evaporation. Be consistent and if you can afford it, invest in a light timer. You may also want to get an aquarium light timer. A light timer can help make running an aquarium that much more enjoyable because it s one less thing you have to mess with. Most higher end fish tank hoods and fixtures have multiple power cords that are tied into the multiple light sockets within the hood. This allows you to setup your timer to turn on the various lights at different times. For instance, a popular hood nowadays is the compact flourescent hood incorporating an actinic bulb, a full spectrum bulb and a moon light. You could set up the timer to turn on the actinic bulb to go on first and stay on for 12 hours, then have the full spectrum bulb come on an hour or so later and stay on for 10 hours. This could simulate dawn and dusk by having the actinic bulbs come on an hour early and stay on an hour later. Finally, you could have the moon lights turn on when the actinics turn off. Who knows, you may even start to see breeding behavior in certain species that may be more in tune with the light of the moon in this type of setup. Another side benefit of using a moon light is the super cool effect it creates in the aquarium when all the other lights in the room are off. As you can see, the type of light you need really depends on they type of tank your running. Freshwater and Saltwater fish only tanks can usually get by with the regular flourescent lights whereas the freshwater plant keepers and saltwater reef tank keepers will need to invest in better light sources. 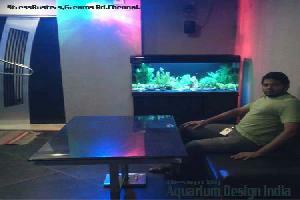 Keywords : Aquarium Accessories, Aquarium Lighting.